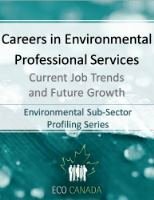 Over the course of ECO Canada’s research on careers in different Canadian environmental sub-sectors, we noticed an important trend: the same 4 occupations kept cropping up. In fact, these top occupations accounted for the largest proportion of job vacancies in our sample, were in strong demand across multiple sub-sectors, and shared a clear connection to Environmental Professional Services. Since these 4 occupational paths represent a strong opportunity for green job seekers, Careers in Environmental Professional Services provides an in-depth look at the characteristics, required skills, and top employer industries for each of these occupations.